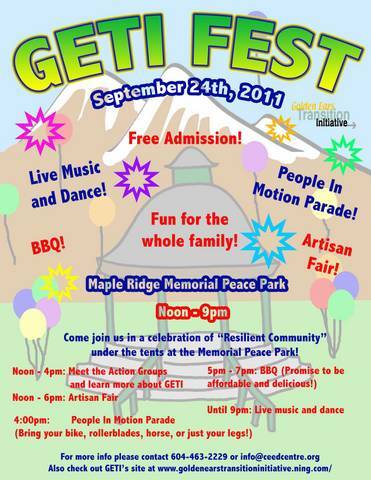 You may wonder what this is all about: "GETI Fest". What is GETI? It stands for "Golden Ears Transition Initiative". GETI tries to raise awareness in Maple Ridge and Pitt Meadows about global warming, peak oil and the impact of our continued unsustainable lifestyles on our planet, and help to prepare ourselves for a less fossil-fuel dependent economy. Check out GETI's website to find out more. This event is one of the many that are being organized worldwide on September 24, under the name "Moving Planet". During the afternoon, from noon till 4 pm, you can wander around Memorial Peace Park, meet some of the people of the various action groups of GETI, see some displays and interactive workshops, and find out more about what we are all doing. Our local Chapter of the Vancouver Area Cycling Coalition is one of the action groups of GETI, and we're very excited to be part of this event. We will have a bus rack at the event for people to practice putting their bikes on, so that they won't have to fumble while the bus driver is waiting impatiently.. Between 1:30 and 3:30 we will also have a bike decorating station for the kids, followed by a fun bike rodeo. Of course we will provide a free bike valet between noon and 9 pm, so that you won't have to worry about your bike while you're exploring all the different GETI-groups and the artisan fair and enjoying the live music. And of course we want cyclists to come out in big numbers to be part of the non-fossil-fuel powered parade, which will take place between 4 and 5 pm! Everyone is welcome. If you can't bring your bike, bring your rollerblades, your dancing shoes or hiking boots, your stilts, your unicycle—anything human-powered. 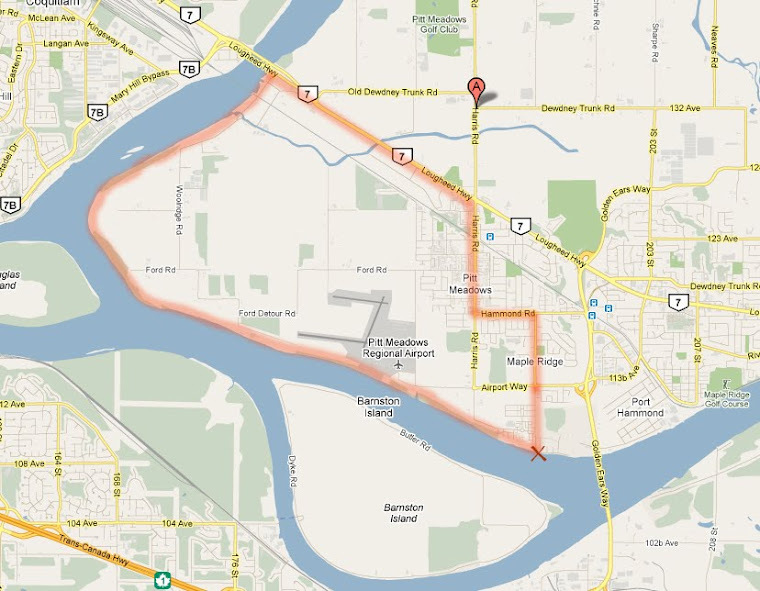 The parade route will be very short: just around the Memorial Peace Park Loop, because this is the very first time that we're doing this. We hope to be able to fill up the whole loop with people. If we can all can make that happen together, we will promise you to make next year's event into an even bigger, car-free street event, with people, not cars, occupying a section of Dewdney Trunk Road! After the parade, dinner will be served (for meal tickets - cost $8 per person - contact Jackie at jchow23708@yahoo.ca), and there will be music and dancing until 9 pm. Fun, fun, fun! Lastly, but certainly most importantly, I would like to appeal to all the children and youth in Maple Ridge and Pitt Meadows. This is your chance to have your voices heard! Be part of the parade! Outnumber us old folks, parents and grandparents! So much of this is about YOUR future, and you have to let all of us adults know that we need to listen to you. Tell us that you want us to act NOW and that you want to be part of it! You do have a voice. So be there! On September 24! Please pass on the message. We would like to have an idea how many people are going to join the parade. So please send an e-mail to blakehandford@shaw.ca to let us know you'll be there. Thanks!